Sorry for the late post this week. It’s a bit of an odd share, with a few new veggie friends. 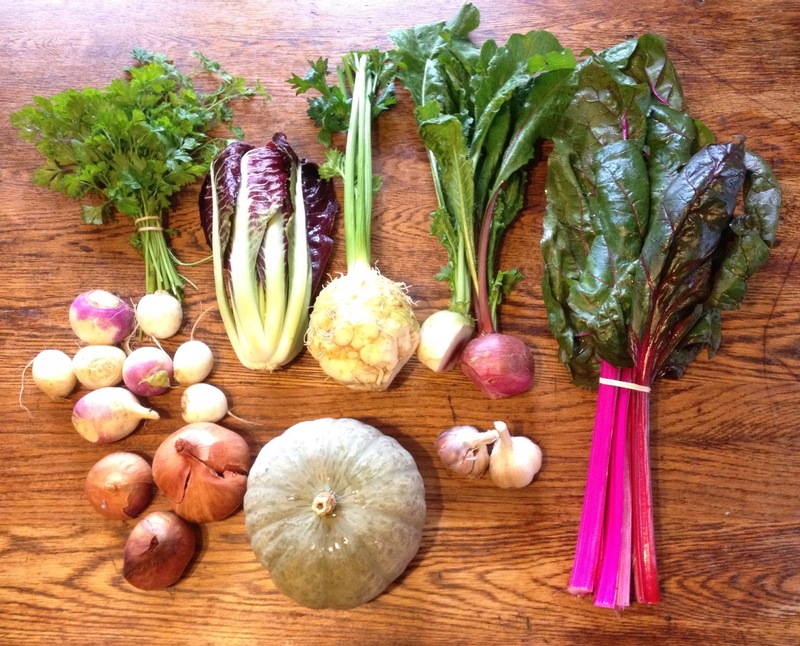 New to the share this week is celeriac, winter watermelon radishes, shallots, treviso radicchio, blue kuri winter squash. And some more familiar items: swiss chard (although this is a new planting with scary HOT PINK stems! ), garlic, turnips (Monday: hakurei, Thursday: hakurei & purple top), and parsley. Celeriac (aka celery root) is sort of like a root veggie version of celery. It’s crazy appearance seems appropriate for Halloween week. The tops are similar to celery (though better in a cooked application). Celeriac can be grated raw for a slaw, or cooked in soups and roasts. The blue kuri squash is great for soups or roasting. It’s a type of Japanese kabocha squash. See the recipe below for kabocha squash/celeriac soup. The radicchio is a great salad item. A cold water soak will help remove some of the bitterness, as will a nice dressing. The watermelon radishes got a bit eaten so I cut off bits of them to clean them up. They can also be a bit Halloween looking with their surprise pink-ish blush on the interior. After removing their outer skins, I like them sliced super thin on salads or sandwiches. Their greens are edible as well – I’d throw them in with whatever you do with the chard. Well the season is winding down but there are plenty more veggies for these last few weeks! As always please let me know if you have any veggie or CSA related questions. Thanks, Matt. Preheat oven to 400F. Cut the kabocha squash in half, scrape out the seeds and strings, and place the halves cut side down on a lightly oiled nonstick baking sheet. Peel the turnips and cut them in wedges. Peel the celery root and cut it into 1-inch pieces. Toss the turnips and celery root with about half a tablespoon of olive oil and a pinch of salt and spread them on another baking sheet. Roast all the prepared vegetables in the hot oven for 50 to 60 minutes, or until the squash gives easily when poked with a wooden spoon and the turnips and celery root are tender and flecked with dark brown. When the squash is cool enough to handle, scoop it out of its shell. While the veggies are roasting, cut the leeks in half lengthwise, wash them thoroughly, and slice thinly – you should have about 1.5 cups. Chop the onion and saute it gently in the remaining 1 tbsp olive oil, with a dash of salt and the rosemary, stirring now and then over medium heat until it is soft and golden brown. In a large soup pot, combine the roasted squash, turnips, celery root, leeks, and sauteed onions with 4 cups water and a teaspoon of salt. Simmer the vegetables, covered, about 20 minutes to let them get perfectly soft. Add 2 cups veggie broth, 2tbsp fresh lemon juice, a pinch of hot paprika or cayenne, and the maple syrup. Allow the soup to cool somewhat, then puree it in a blender, in batches, or in the pot with an immersion blender. The various flavors in this soup are better when blended into one harmonious new flavor, but you can make the texture whatever you like. I prefer this as a silky-smooth soup, but you can stop at a rougher puree if you like. Add a little more vegetable broth if the soup is too thick to pour easily from a ladle. Return the soup to a clean pot and bring it back to a simmer. In a small saucepan, melt the butter over medium heat. Lower the heat and keep cooking the butter for a few minutes, stirring with a whisk, until it is a light golden brown. Stir the browned butter into the soup. Taste the soup, and correct the seasoning, whisking in more salt, lemon juice, or maple syrup as needed. This last step is essential, as kabocha squashes vary in sweetness and lemons certainly vary in acidity. As always, when working on the sweet-sour balance you reach a point where only a good pinch of salt will make it right. Sprinkle each serving of soup with a spoonful of toasted chopped pecans.